What Happened in Los Angeles? : In the city of Los Angeles, more than 118,000 voters were left off the voting rolls, and so got an unpleasant surprise when they showed up to vote. While such individuals are allowed to cast provisional ballots, many of them left their polling places in search of the "correct" polling place, or else just gave up. Even those who took the provisional ballots will be subjected to California's silly law that their signatures must match the signature on their voter registration (in the opinion of an untrained-in-handwriting-analysis poll worker). The mistake was explained as a "printing error," which may or may not be French for "Russian hackers." The mess is still being sorted out, but the regions of the city that were affected were disproportionately Latino. Antonio Villaraigosa is calling for the polls to remain open until Friday, but it's rather unlikely that this hurt him, since he's in third place by nearly half a million votes. It's more possible that the fiasco affected the tally in CA-39, a district the Democrats badly want to flip, where Latino philanthropist Gil Cisneros (D) is holding on to second place by about 4,000 votes (14,993, compared to Republican Phil Liberatore's 10,851). If Cisneros ultimately advances, there shouldn't be too many objections. If he does not, lawsuits are likely. Jungle Boogie: Quite a few California races are too close to call, since the state is going to have an unusually large number of provisional ballots to count, along with absentee ballots (some of which may not be received until Friday). At the moment, the Golden State's jungle primary system does not appear to have generated too many anomalies. Lt. Gov. Gavin Newsom (D) ended up with a fairly standard Republican opponent, John Cox, in the gubernatorial race. Expect Donald Trump to take full credit for Cox's success. The U.S. Senate race and the lieutenant governor's race are looking like they will feature two Democrats (Sen. Dianne Feinstein vs. Kevin de León, and Eleni Kounalakis vs. Ed Hernandez, respectively). That's not a terribly big development, however, since the Democrats were sure to win both of those contests, regardless of their configuration. Among the House races, 40 of 53 will feature a Republican vs. a Democrat. There will also be three (CA-13, CA-19, CA-32) with an unopposed Democrat, two (CA-5, CA-20) with a Democrat facing an Independent, two (CA-34, CA-40) with a Democrat facing a Green, and three (CA-6, CA-27, CA-44) with two Democrats. Those 10 districts have Cook PVIs of D+40, D+24, D+17, D+21, D+23, D+35, D+33, D+21, D+16, and D+35, respectively, so the GOP had no real shot at any of them, jungle primary or not. In CA-50, meanwhile, Democrat Ammar Campa-Najjar holds a narrow lead over Republican Bill Wells for the second spot on the ballot, 11,218 votes to 9,478. That district is R+11, though, so the blue team won't feel that bad if Campa-Najjar drops into third and it ends up as a two-Republican show. There are two districts, however, where the Democrats are going to spend the rest of the week sweating. In CA-10, which has a PVI of even, the Party would love to knock off incumbent Jeff Denham (R). They will only have a chance to do it if Josh Harder (9,014 votes) clings to his slim lead over Republican Ted Howze (8,406). Meanwhile, in the now-famous CA-49, incumbent Dana Rohrabacher will advance to the second round. Depending on how the remaining ballots fall, he could face off against Democrat Harley Rouda (18,182 votes), Democrat Hans Keirstead (18,109), or Republican Scott Baugh (16,963). In short, if everything holds, which is probably what will happen, then the jungle primary will have had no meaningful impact. If things go badly for the Democrats, it could ultimately cost them a chance at 1-3 seats. A Blue Wave? : The Democrats are really hoping their turnout will be way up this year in response to Donald Trump. That could still happen but, if so, there was little evidence of it on Tuesday night. Turnout was pretty much in line with 2014, the last non-Trump midterm primary. One should probably not infer too much from this, though. Primaries generally attract regular voters, while general elections generally attract regular voters plus enthusiastic irregular voters. If Donald Trump is going to create enthusiasm where it doesn't normally exist, we would generally expect to see that in the general, not so much the primaries. What Revolution? : Our Revolution, the organization created by progressive followers of Sen. Bernie Sanders (I-VT), endorsed 31 candidates on Tuesday. Only five made it through to the next round: Audrey Denney (CA-01), James Elia (California AD 71), Deidre DeJear (Iowa Secretary of State), J.D. Scholten (IA-04), and Jennifer Merecki (Montana SD 22). If Ammar Campa-Najjar survives in CA-50, that will make it six. None of those folks is very likely to win their elections. Meanwhile, the Democratic establishment got the candidates it wanted almost everywhere, most notably in many New Jersey and California House races, in the Iowa governor's race, and in the New Mexico governor's race. GOP Establishment Gets Their Candidates, Too: There were a few races where the GOP pooh-bahs wanted a particular candidate so badly they could taste it. They generally got what they wanted on Tuesday night, too, namely in the Montana Senate race and South Dakota governor's race, and in a couple of New Jersey house races (NJ-5 and NJ-11). Making History: NM-01 is being vacated by Michelle Lujan Grisham, who was nominated for governor on Tuesday night. It's got a PVI of D+7, meaning that the winner of the Democratic primary is probably headed to Washington. That happens to be Deb Haaland, who will thus probably become the United States' first Native American congresswoman. Love Trump or Leave Him? : In Iowa, where Donald Trump is unpopular, Trump-loving Gov. Kim Reynolds (R) is going to face stiff opposition from moderate anti-Trump Democrat Fred Hubbell. Reynolds is likely wishing she'd kept Trump a bit more at arm's length. On the other hand, Rep. Martha Roby (R) has definitely held Trump at arm's length—actually, more like, "won't touch him with a 10-foot pole" length—since the pu**ygate tape. That does not please Alabamians, since they like the Donald. She will now face Bobby Bright in a runoff. As he is a Republican who used to be a Democrat, he could peel off enough crossover votes to unseat the congresswoman. The story of the Philadelphia Eagles' canceled visit to the White House, which was originally scheduled for yesterday, has gotten even more embarrassing for Donald Trump. On Monday, the report was that only 10 of the team's 70 players planned to visit the White House. On Tuesday, we learned that number was just a bit high. Actually, only one planned to go (QB Nick Foles). A picture of Trump "surrounded" by one guy would have looked even worse than the inauguration photos. Trump (and his friends in the media) tried to make the best of the situation. As we've noted, mere lies aren't always enough these days, as the President has moved on to actively creating an alternate reality. Towards that end, Fox News chipped in by publishing a bunch of photos showing those ungrateful, unpatriotic, selfish Eagles kneeling during the national anthem last season. The problem is that, as we and many others noted yesterday, they were one of the handful of no-kneel teams last year. In fact, the pictures showed players who were kneeling in prayer, something that Trump and his base believe is apropos at a football game. Fox has already apologized for the misleading photos. That outlet often hides behind the notion that their news-gathering operation is committed to truth and accuracy, and that it's only the opinion operation (e.g., Sean Hannity, Tucker Carlson) that says and does outrageous stuff. This is just one example (among many) that even the news division is more than willing to tote GOP/Trump water. One can't help noticing the significant shortage of: (1) Non-white people, and (2) Eagles hats, shirts, jerseys, etc. Further, a Philadelphia reporter was there, and he could not find a single attendee able to name the quarterback who led the Eagles to victory in the Super Bowl (ironically, it was Nick Foles). As anyone who has been to Philadelphia on an NFL Sunday can attest, it is inconceivable that a group of 1,000 Eagles fans would have so few non-white attendees, would feature so little team gear, and would have nobody able to name Foles. 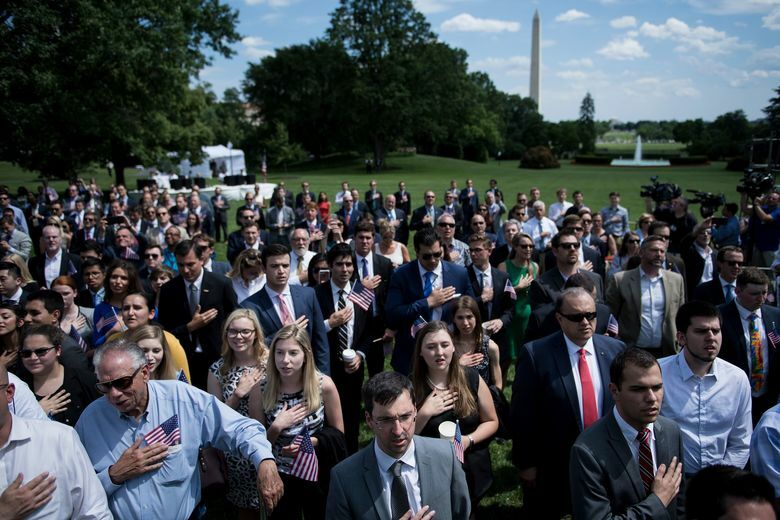 What it appears to be is a gathering of White House and Congressional interns. Whatever it was, it still went badly for Trump. Even though the event lasted only seven minutes, there was a kneeler, and a heckler, and Trump managed to fumble (pun intended) the lyrics to "God Bless America." The part he screwed up: "Stand beside her/And guide her/Through the night with the light from above." In other words, he couldn't quite remember the part about leading the country. Freudian slip? After meeting with Kim Kardashian, who pleaded the case for pardoning Alice Marie Johnson, a 63-year-old woman sentenced to life in prison for drug possession and money laundering, Donald Trump is seriously considering pardoning her. Chief of staff John Kelly and White House counsel Don McGahn are disturbed by the idea, but Trump is attracted to it because (1) it was proposed by a celebrity, and (2) pardoning is one of the very few areas where he can act alone with no oversight or pushback from anyone. A new Politico/Morning Consult poll shows that 58% of Democrats think Congress would be more productive if there were more women in it. In contrast, only 31% of Republicans think this. Most Republicans think that men are better at the core functions of government. This difference in views has political consequences. Over 600 women are running for Congress, a large number of them in Republican districts. If Republican voters don't think too much of having women in Congress, they are not likely to vote for female Democrats. So, in many cases, if a woman wins the Democratic primary in a Republican district, she may face an uphill battle, whereas a male Democrat might stand a better chance. Senate Majority Leader Mitch McConnell (R-KY) is up to his old tricks. He is using his power as leader of the Senate in a highly partisan way (just like when he refused to hold a vote on Merrick Garland's confirmation to the Supreme Court). This time it is not about votes, but about vacations. Normally, the Senate shuts down for all of August because (1) D.C. reverts to the unbearable mosquito-infested swamp that it was before Congress showed up in 1800, (2) Senators need time off from all the tough legislating they have been doing all year, (3) The small number of senators who are not hiding from their constituents may want to talk to them, and (4) That's what the Senate has always done. This year the Senate will stay in session for all but a week of August. Kelly Sadler, the White House aide who gained infamy by joking about Sen. John McCain's impending demise, lost her job on Tuesday. Whether she is unemployed, however, is unknown because the White House isn't saying. Previously, more than one "disgraced" White House staffer has been transferred to the RNC or the Trump 2020 campaign organization. In retaliation for tariffs on Mexican steel and aluminum, Mexico has struck back with tariffs of 25% on cheese, steel, and Tennessee whiskey, along with 20% tariffs on pork, apples, and other agricultural products. Canada has also announced tariffs, but they won't go into effect until July 1. A trade war could affect the midterms when farmers and others see their sales fall due to other countries responding to Donald Trump's tariffs. Jun03 Who Will Pay for Kim's Hotel Bill? May31 All the Way with the ERA?